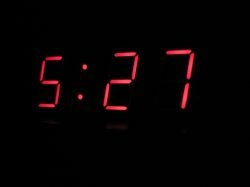 It was still dark Sunday morning, the clock read 5 AM, and I awoke from my three hour snooze relatively easily considering. The shower did wonders, and within 17 minutes I was back in my room, dressed, and photographing my alarm clock. It seemed appropriate to kick off a trip to the city that never sleeps (or is that New York?) with little to no sleep myself, and I was quite excited to get there. The six of us - my parents, grandma, Nicole, Shawn (the bar manager), and myself - made it to the airport just in time and soon were flying south to Minneapolis and then Las Vegas. I will say one thing on the combination of excitement and lack of sleep. Giddyness ensues. I think we were all a little giddy, and at one point even the emergency procedures in the airline's seat pocket was hilarious to me. 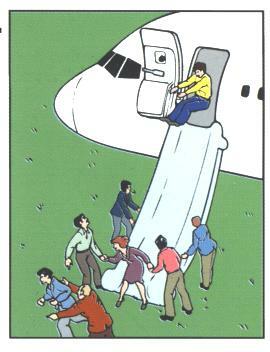 In particular, one drawing showing a guy about to slide down while the people on the ground below look like they are terrified/shocked to see him coming down at them and some run for their lives while others are frozen in fear and the guy hovers mid-air ala William Shatner in Family Guy. Anyway, the image of hilarity is there on the right. Like I say, giddy. The snow in Minneapolis and also Saskatoon delayed our arrival in Las Vegas a little, but we arrived by 2:00 and were soon in a limo that was waiting for us (finally, one of those people with signs was waiting for me!) off to the MGM Grand. The airport was surprisingly close to the airport, so it was a short limo ride, but that's hardly the point. We were soon at our hotel and then looking around. We checked out New York, New York and walked around the area a little bit and it was soon dinner time. The buffet was pricey but good, probably the best buffet I've ever had which admittedly isn't saying much, but it was good, truly. I really liked their mashed potato bar, and of course they had lots of dessert and everything else. 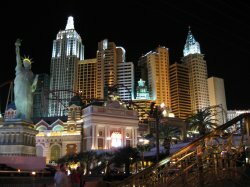 We went out for a stroll along the strip again that night, my dad, Shawn, Nicole, and myself, and it was even more impressive. The lights of the city lived up to expectiations, that much is certain. The Bellagio was certainly the highlight in my mind, especially the amazing fountain in front of it. There's a video of it at the bottom of the page. Aside from the fountain, the interior was amazing. 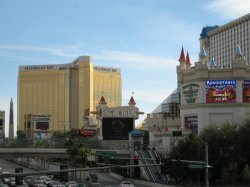 Just beautiful, ritzy, all the things I'd expected from Vegas, but even more so. We also looked through some of the shops at the ridiculously expensive stuff in Caesar's Palace, mostly looking at stuff for Nicole, purses, shoes, and so on. She didn't get anything, and I wouldn't have either, but it was interesting to see. I retired to the blackjack table with my dad that night and some of the others were out in the lounge. My aunt and cousins were also in town, so they had some drinks. I did pretty well at the blackjack table, I think by the end I was up almost $300, but it wouldn't last long. I was too tired as I was the only one who hadn't slept on the plane, so I didn't stay for drinks with everyone, but went off to sleep. 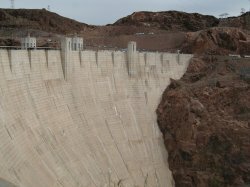 The next day, I'd wanted to rent a car and drive out to see the Grand Canyon and Hoover Dam, but the Grand Canyon is pretty far, and so while the girls went shopping, we headed out to Hoover Dam... in a limo. What a way to go! The trip was fun, we had a little 'spirit' in the back and of course the dam itself was impressive. A monstrous wall of concrete holding back who-knows-how-much water. You really can't get a sense of the size of it from photographs, but I tried my best. It was well worth taking a trip out to see it, and now I actually want to do more reading to see how they built it. Just amazing. The geography around there was really cool too, desert hills and canyons and so I didn't feel bad at all about missing the grand canyon. You know, especially since we were travelling in style. The rest of the day, there's very little to tell about, we had dinner, we gambled some more, I went from being up $300 to down that much, and we all had some fun. Finally, Tuesday, the reason we were there: the food & beverage show. Or rather, the beverage & food show. 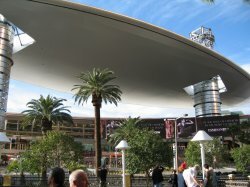 It was in the cavernous Las Vegas convention centre and we spent the whole day seeing only half the show. There were a lot of neat ideas and it was intersting to see what's coming up in the beverage and bar end of things. Of course, with all the free samples of various concoctions, it could get a person into a lot of trouble, but we were certainly okay. Tequila being as popular as it is down there, I was saved from a lot of sampling thanks to my boycott of said liquid. 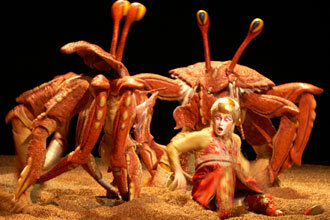 That night, we all went out and saw Ka, a Cirque du Soleil production that was just incredible. The amount of talent these guys have, not to mention the production, just, wow. Stages spun in mid air frenzies, stood vertically for wild cliff escapes and battles, churned like the sea, and innumerable other unimaginable things. I can safely say without further qualification that you've never seen anything like this. 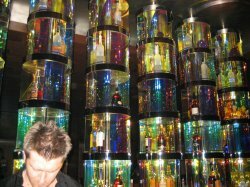 We went out later that night to a club in the MGM, a rather crummy club, called Tabu. The doorman was a complete T$#^()#$*SDFG and we certainly had to fight to get ourselves in. Jeff from Overdrive was there, and certainly helped. Once in, it was fun enough. A little dancing, drinking, and Shawn completely hilarious, it was good in spite of itself, mostly because of our own company. There was a girl in a blue shirt, a dance with a silver-fox, a couple from California that toppled, and various other schenanigans. Finally, our last day in Vegas, us boys went back to the beverage & food show while the girls went shopping, and then afterwards, my dad went to get Nicole tickets for Celine Dion while Shawn & I also went shopping and looked at some of the hotels. I got myself a couple shirts (which Shawn naturally saw and was so impressed that he got similar ones himself) and a pair of jeans, only to return and discover my mom had also procured a few shirts and a jacket for me, so pretty much, I have a new wardrobe. At least I came home with something, Vegas stole more of my money that night, and I had what may be described as the rawest burger I've ever had, which I largely blame on Shawn. Though to his credit, he noticed before I did. Anyway, Las Vegas was far more fun than I expected, and the strip extended far longer than I thought. We boarded the plane for snowy Saskatchewan on Thursday and arrived home safe, sound, and thoroughly inspected by Customs. It was a fast-paced trip but lots of fun, and somewhere I'd certainly return again, even if only to see more shows like Ka or spend a day watching the fountain at the Bellagio. Now, if I will do my best to do so from here.